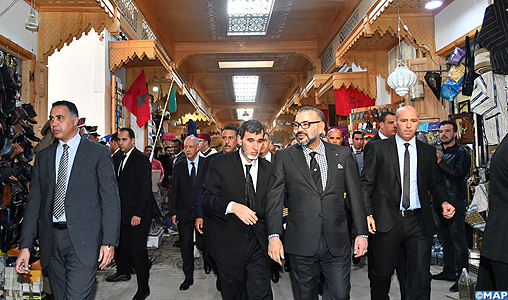 King Mohammed VI visited, on Monday, several projects that fall within the framework of the Rabat Old Medina Rehabilitation and Upgrading Program, one of the highlights of “Rabat City of Light, Moroccan Capital of Culture” integrated program that was launched by the sovereign on May 12, 2014.
the King Mohammed VI visited the Bab Chellah street, including the Mohammed V schools and the great mosque, the Souk Essabat street and Bab El Bahr, sites which have been revamped under the Rabat old medina rehabilitation program. The implementation of this ambitious program was backed by the launch by the King Mohammed VI, on May 14, of a complementary program for upgrading the Rabat old medina, totaling 325 million dirhams. On this occasion, the King Mohammed VI was greeted by representatives of associations in the old medina and handed, in a symbolic gesture, the keys to beneficiaries from bicycle-taxis, purchased under the tourist and ecological transportation project in the city of Rabat, as part of the National Initiative for Human Development (INDH).